I’m going to call it Lt. Dan. Still tinkering with the little robot kit I got a while ago. I made some new legs and thought I’d do a before and after. Here, with the originals that came with the kit. And with the new, more terrifyingly clawlike upgrades. I have never gotten it to walk in a totally straight line – there’s always at least a little drift (typically to the right). This may be due to the leg design, as I am not using the same orientation as shown in the example videos presented by the guy who put the kit together. I might not be compensating correctly for the way the legs attach to the brackets. They all attach to one side, so they don’t line up perfectly. Or it could be that some of the servo gear teeth were stripped when my nephew kept insisting he needed to help its legs. 1. Without the little foam wheel-feet, the legs seem to just slide around on the floor a lot. 2. Servo motors slowed to .25x speed sound a lot like heavy mouth-breathing. 3. My dog’s will is utterly broken by the mechanical horrors he has to contend with on a daily basis. He doesn’t even try to hide from them anymore. I got some Sugru to put on the tips of the legs. Hopefully this will help with getting some traction. When they have to fight, the rage comes over them and they turn into a more primitive and aggressive form of machine. Ok, humans have been around long enough now that it has become obvious that we are more or less the same. Most people can look at another person and know they are of a kind, driven by the same urges and feelings. But it’s like 1776, and we don’t know why that is so, God. That given, there are a few thing that we just have to agree to be cool about. We each have the right to life. This is predicated upon non-interference with rule 1 (in the immediate sense). We each have the right to liberty. This is predicated upon non-interference with rule 1. We each have the right to pursue happiness. This is predicated upon non-interference with rules 1 & 2. Here is a picture of some dirt. 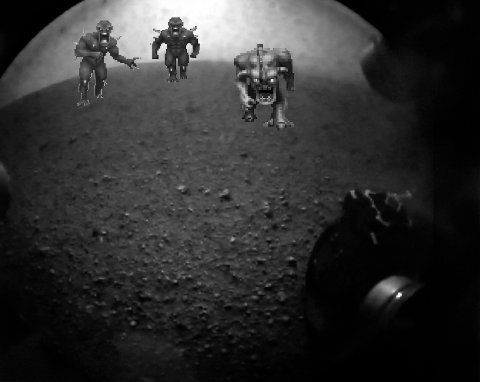 On Mars. 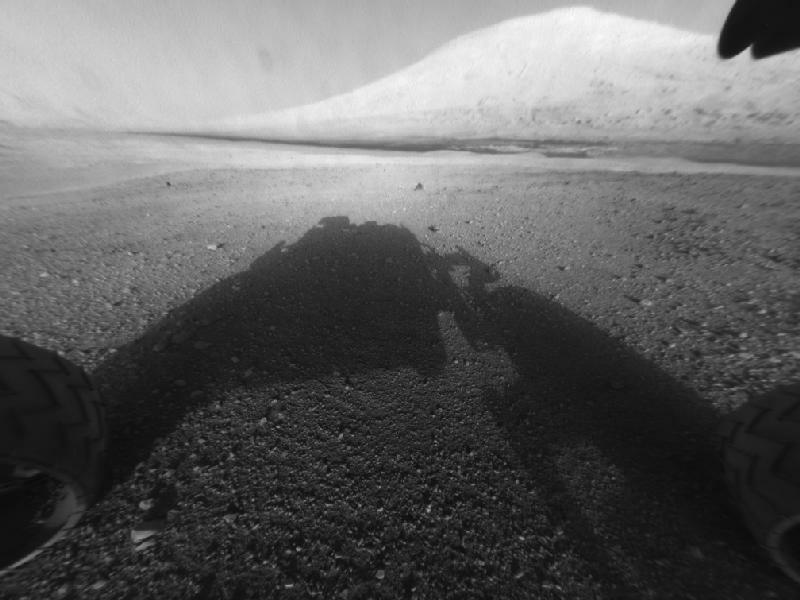 I know curiosity is not the first of our robot emissaries to the red planet, but gazing at the soil on another world has not gotten old yet. Even though we have apparently been doing it for some time now. And when I say “we”, I mean “we” as in humans collectively, not Americans. That particular feather was in a Soviet cap1. I kinda miss the cold war. It was understood that we could destroy each other, but nobody really wanted to do that so we just competed over who had the most awesome space program. Then people lost interest – probably because exploring space is something the Nazis would do. This morning I walked past my roomba, and noticed that it was sitting slightly off the charger and every led on it was blinking frantically. I nudged the little robot back up on to its dock, which resulted in it announcing something about a charge error – first in English, and then (presumably) repeating it in French. I started pressing buttons trying to cancel out the message, which resulted in it continuing to complain exclusively in French. It eventually quieted down, and I flipped it over to see if it had something blocking the charger connection points. As soon as I flipped it over and started brushing at the connections, the thing goes completely franco-batfuck again, flashes all of its lights once or twice and then dies completely. It is now sitting on the charge dock not charging, so I am pretty sure I witnessed some insane robot death-rattle. When I was a kid, I assumed I would have robot servants at my disposal. I never really contemplated the scenario in which they go mad and scream at me in French. T-1000 wants to sweep your floor. And by sweep, I mean absorb debris into its gelatinous form. As it lurches to and fro in your home it will undoubtedly leave disgusting little snail trails of pseudo-organic slop in it’s wake. It’s . . . it’s probably good for the floors, right? Like wood polish. Just kidding, iRobot didn’t make this to clean your house. They just won a contract from DARPA and U.S. Army Research Office to make a ChemBot. It probably won’t even show up at your house until it needs to impersonate one of your loved ones. DARPA envisions the palm-size ChemBot as a mobile robot that can traverse soft terrain and navigate through small openings, such as tiny wall cracks, during reconnaissance and search-and-rescue missions. It gets around by way of a process called “jamming,” in which material can transition between semiliquid and solid states with only a slight change in volume. They say “search-and-rescue”, but all I can picture in my head is this scene. It would be extra horrifying if the little blob-bot actually thought it was helping the whole time. They have to establish dominance. Any interference on your part will only make them feel confused and anxious, leading to further aggression. In other news, I finally have Gallery up and running again. More robuts are available there. Incidentally, if my robot legion does not overwhelm you, I also have beasts at my disposal. My plan of conquest is comprehensive.